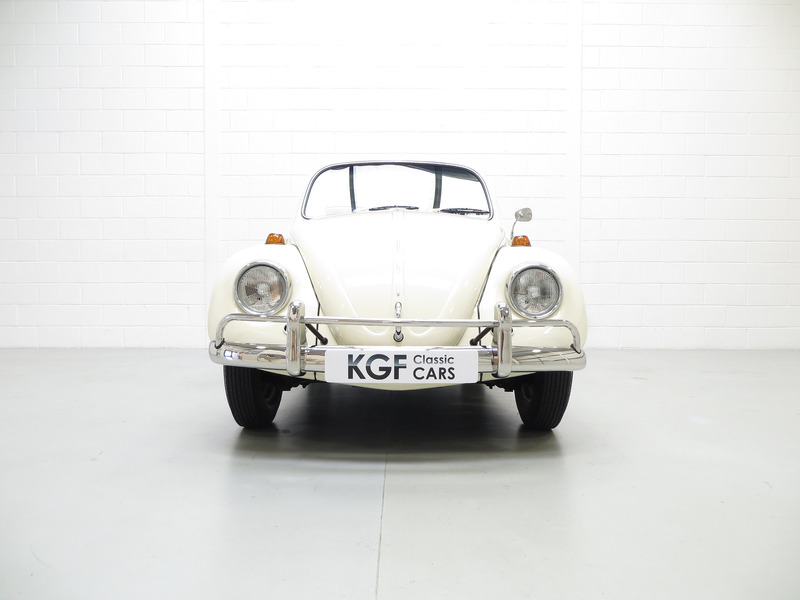 Originally listed and sold through KGF Classic Cars, this ’67 Beetle is an interesting find that I wanted to share. They say a photo (and video) is worth a thousand words. With that in mind, I’ll let these do their justice. Feel free to chime in with any comments. Oh my, I think I see SB12 on the headlight rings. I need a cold shower. Chrome window trim, chrome bumpers, bumper guardians, bumper rails, bezel vents, sill vents, chrome wheel covers, chrome driver’s door mirror, chrome waist strip, chrome bonnet line, running boards, horn pad with Wolfsburg crest, emergency flashers, interior light, padded dash, assist straps, headlight flasher, glove box, door pockets, twin sun visors, grab handle. Optional extras; White wall tyres, seat belts, vent wings. 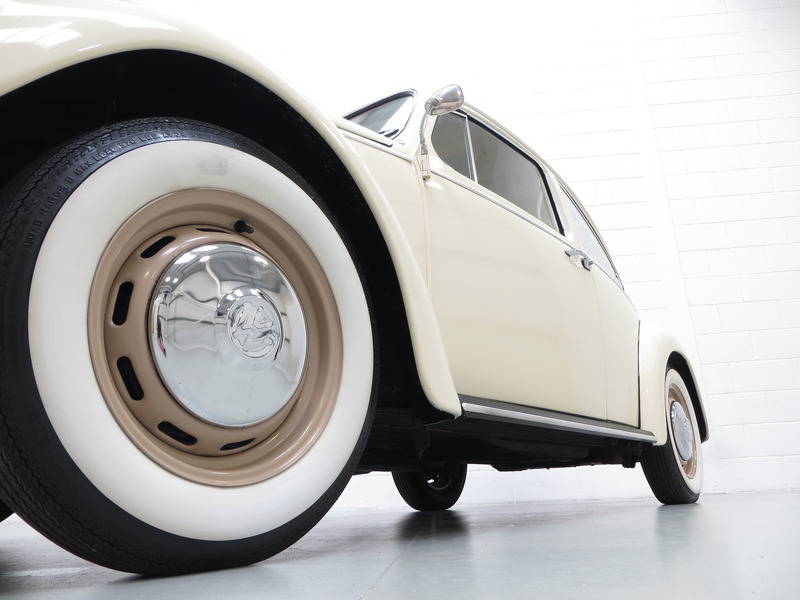 This astonishingly beautiful Beetle is finished in Volkswagen Lotus White (code L-282). 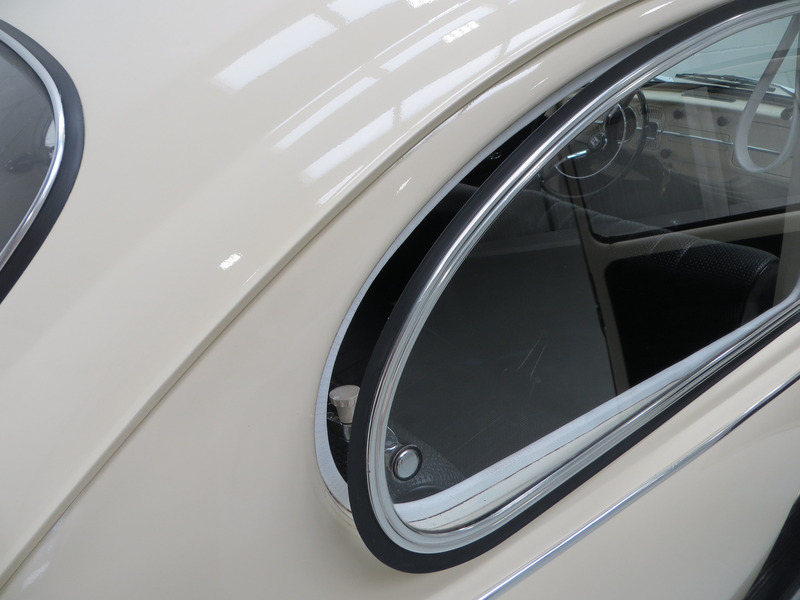 The stunning paintwork has a brilliant pure shine and a smooth high quality finish extending to all internal painted sections. This 1967 registered example is a factory correct 1966/67 model year crossover with components and specification shared between both model years. 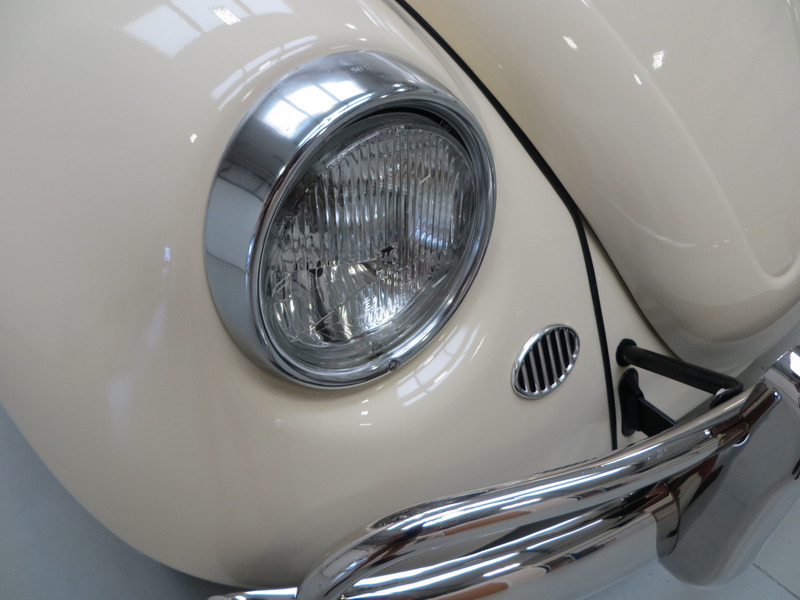 Pre ’67 model year fitments include the older style push button door handles, red turn signal lenses, non-external fuel filler, absence of hood vents, absence of push button hood handle and the older style lower sited bumpers with ‘towel rail’ extender rails. 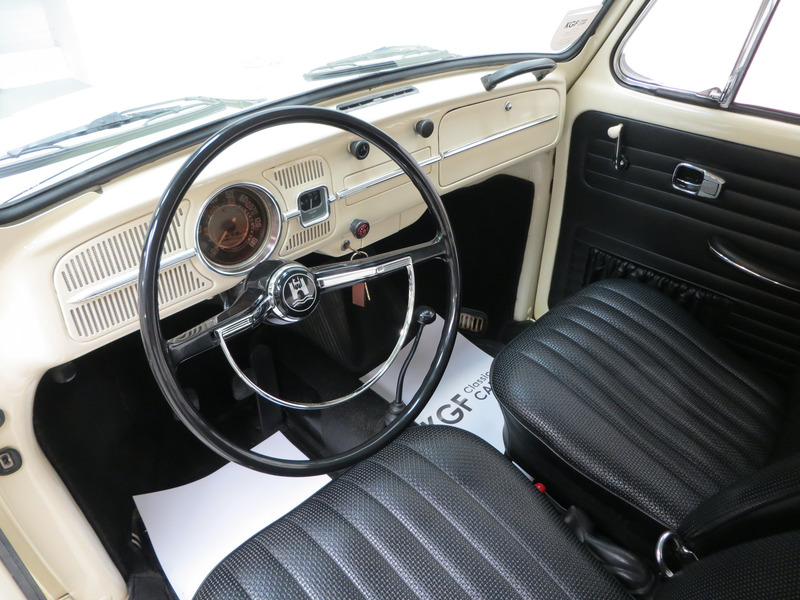 In contrast the revised ’67 features fitted to the car include the emergency flashers, slotted wheels, rear window openers and larger blade two-speed wipers. Perfect originality can be witnessed in items such as the SD12 Hella headlamp rings and Hella reverse lights. 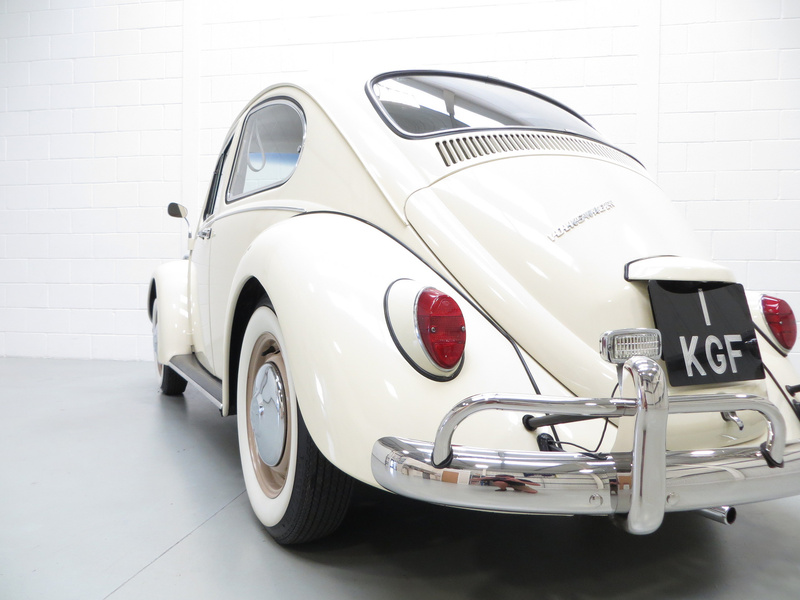 A remarkable ‘hybrid’ example that is wonderfully preserved and truly represents the factory build specification. 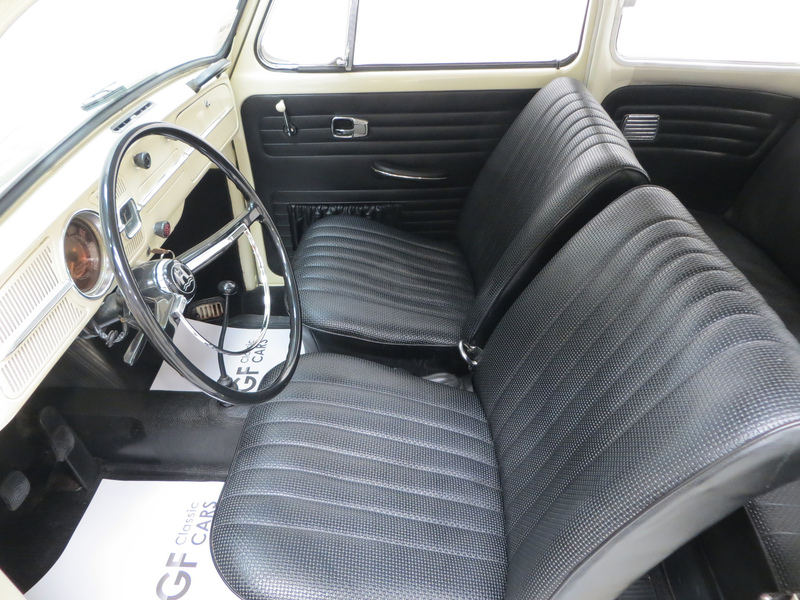 The black leatherette upholstery has remained exactly as Volkswagen intended with no modification whatsoever. 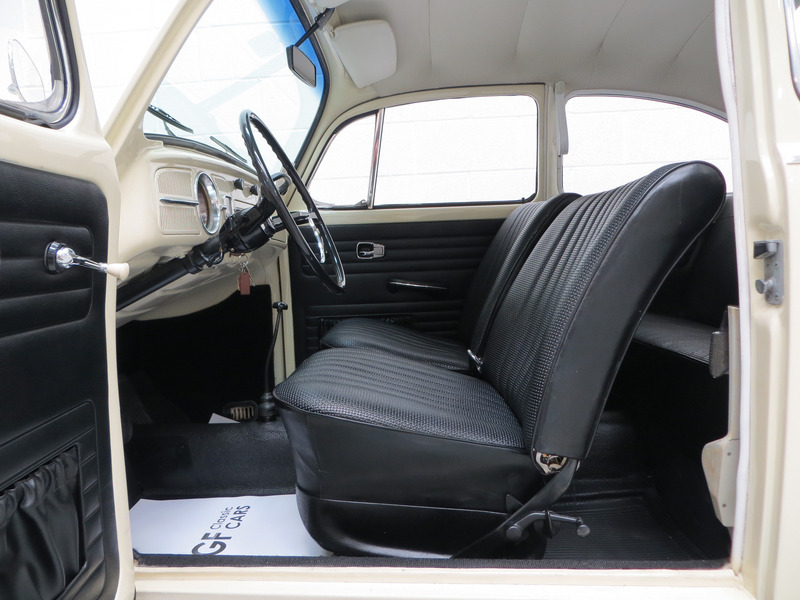 The original seats, remarkably well cared for throughout years of cherished ownership have suffered no damage at all and the structure of each seat has retained all integrity to offer surprising comfort! 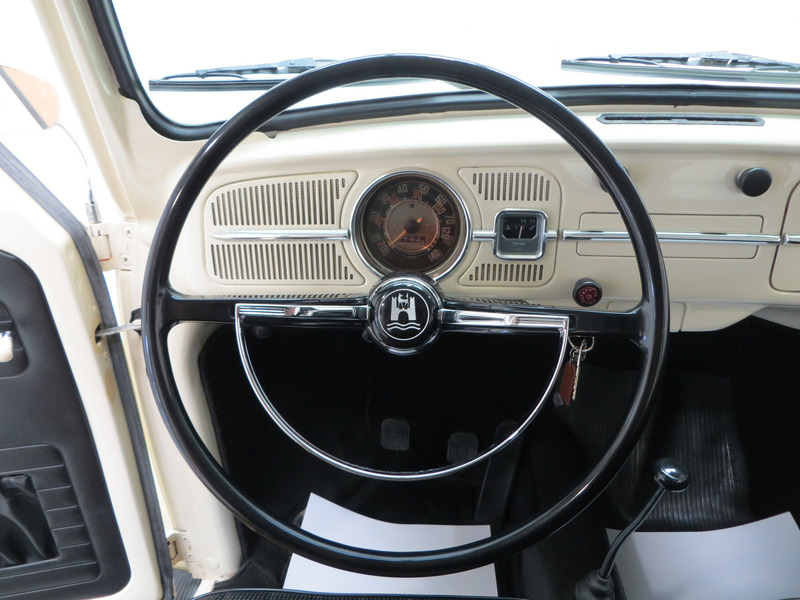 The factory original steering wheel with Wolfsburg crest and horn bar is immaculate, as are all additional functions and controls. 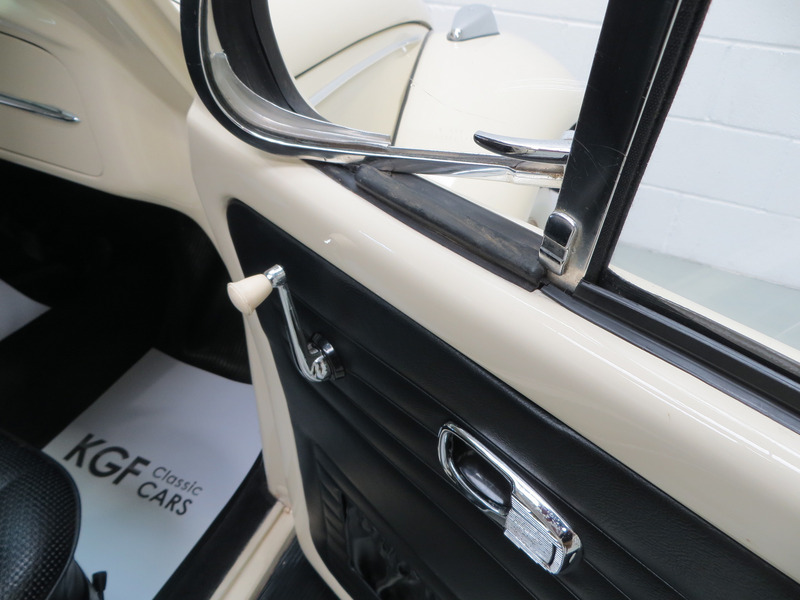 All matching door cards and black carpeting is spotlessly clean, as is the headlining which is intact and free from discolouration. A delightful touch of originality in the form of the temporary km/h plastic overlay on the speedometer relates to the cars initial months of touring Europe and can either remain on proud display or be removed at the new owners discretion. A truly fantastic testament to years of fastidious and cherished ownership. 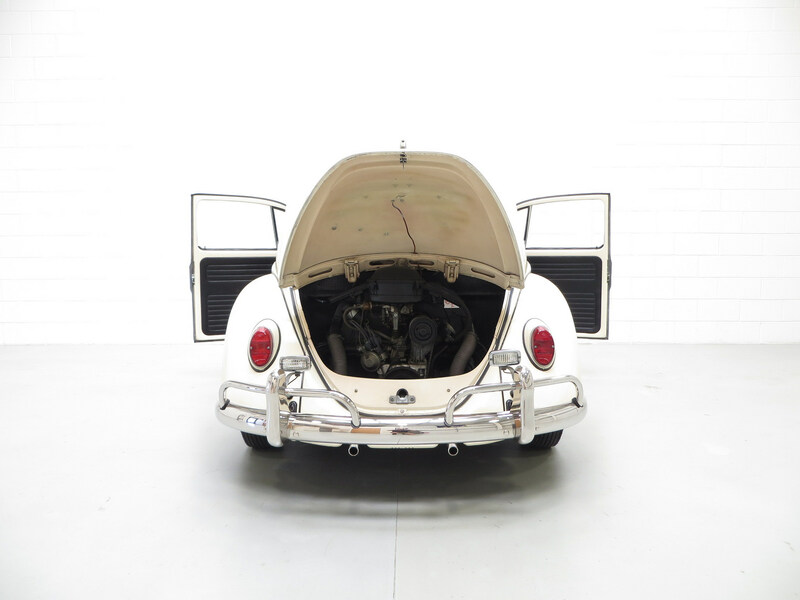 The air-cooled rear mounted engine is housed in a beautifully clean engine bay with an emphasis on originality and meticulous maintenance clearly evident. 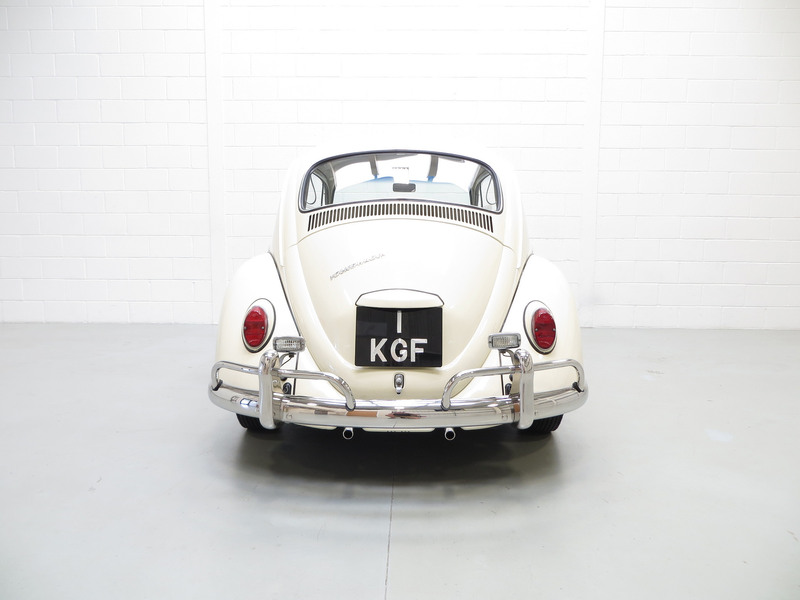 A power output of 53bhp and 78.1ib.ft of torque from its 1493cc displacement delivers a top speed of 78mph and 32mpg, whilst the unmistakable VW Beetle engine note is delightfully pronounced but completely unobtrusive. The fully synchronized 4-speed gearbox of single plate dry clutch type operates perfectly offering light and precise progression throughout the range. 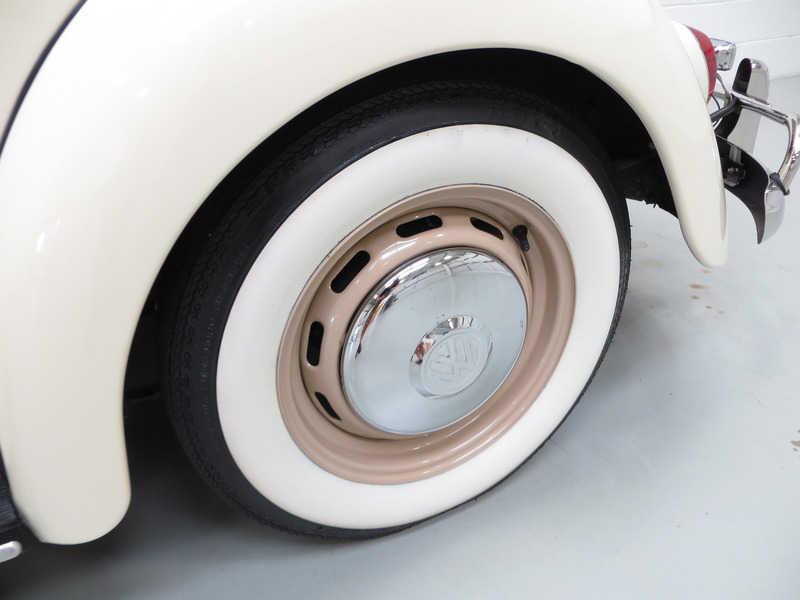 Five pristine powder-coated pressed steel wheels feature the ’67 model year slots for aided brake cooling and are shod in matching and factory correct (optional) Coker Classic 5.60-15 whitewall tyres with masses of tread remaining. 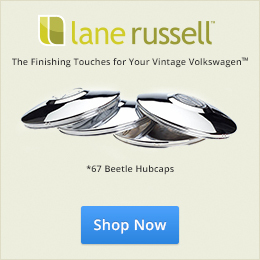 The chrome hubcaps are factory originals and show only the faintest pitting. Dual circuit braking system offers modest stopping power with firm pedal action a necessity, exactly as they were made! Rarely does any classic car come with such a vast and truly fascinating history file allowing the enthralled reader to become fully conversant with the cars lifetime. 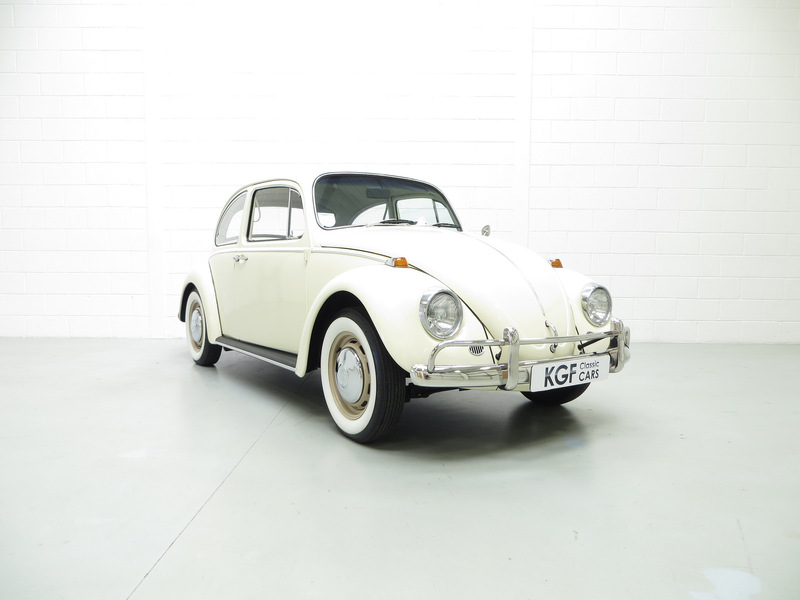 The affectionately named ‘Otis’ was registered new on 10th August 1966 by VW-Werk AG of Wolfsburg Germany, a pre delivery stamp in the first of three service books is dated 7th July 1966. Further stamps in the books, some even with the oil change tags from the 1960’s help to trace the European tour undertaken by the first keeper Commander Otis R Cole of the US Navy with entries from VW Main Dealers in Rheine, South Kensington and Madrid! After the family touring holiday the vehicle was imported to its long term US residence with the first of many US service stamps being at Rinehart Volkswagen in Miami in October 1967 at 15,608 miles. 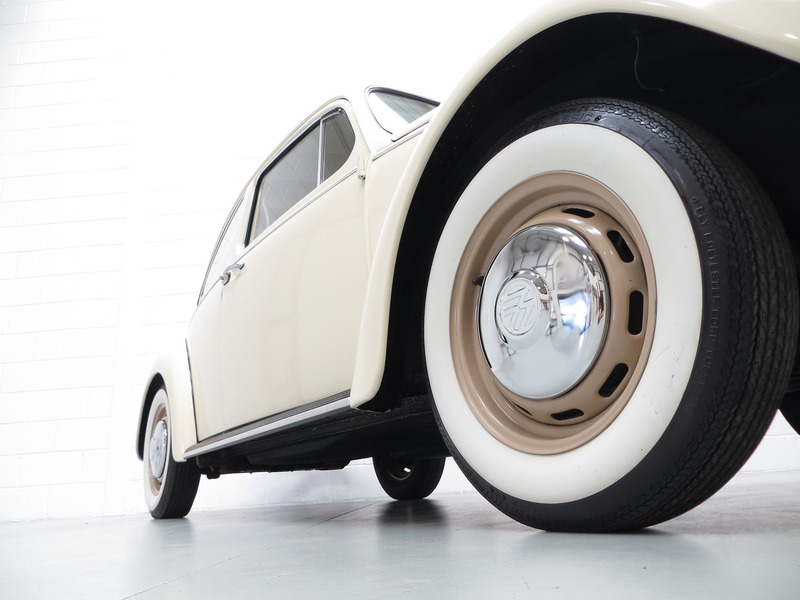 Upon his passing, the Beetle was inherited by the son of Commander Otis Cole named Otis Cole Jnr where it remained largely unused until Mr Brian Hardy of California purchased the car and recommissioned it. Email correspondence between Mr Hardy and Otis Jnr recall fond memories of the car’s travels. 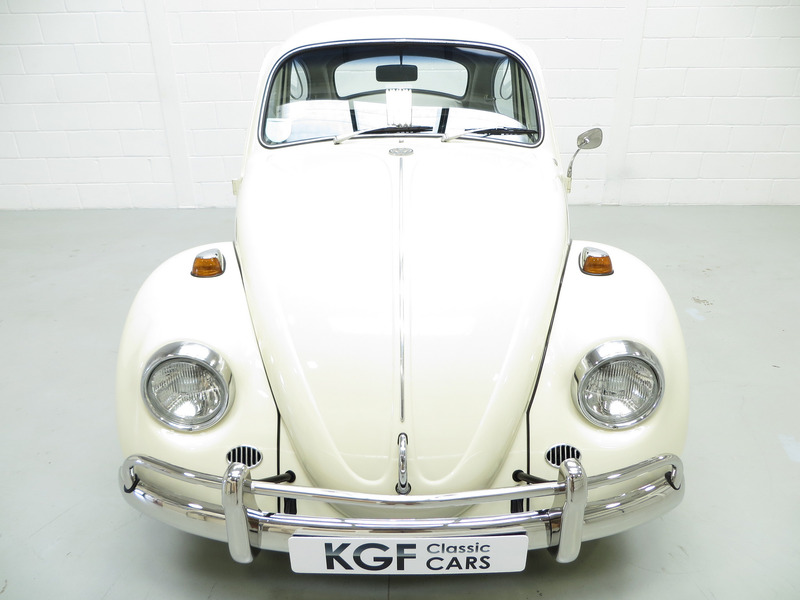 The final owner, a renowned UK VW collector, purchased the vehicle in from Mr Hardy and has continued to love this very special car. Beautiful. Stunning really. Just curious, I was always told my Savannah Beige 67 would’ve originally had color matched fender bead and chrome bumper brackets, instead of black. This white 67 also has the black bead and bumper brackets. Were both an original option? Yes, your car should have matching beads and running boards. If you search my name, “Eric Shoemaker” on the site, you’ll see my car. It’s the same as yours and 100% correct. Also, give these a look. Very nice car. Great looking detail in most areas and the paint looks great. Why would the wheels be another solid colour? Just curious. 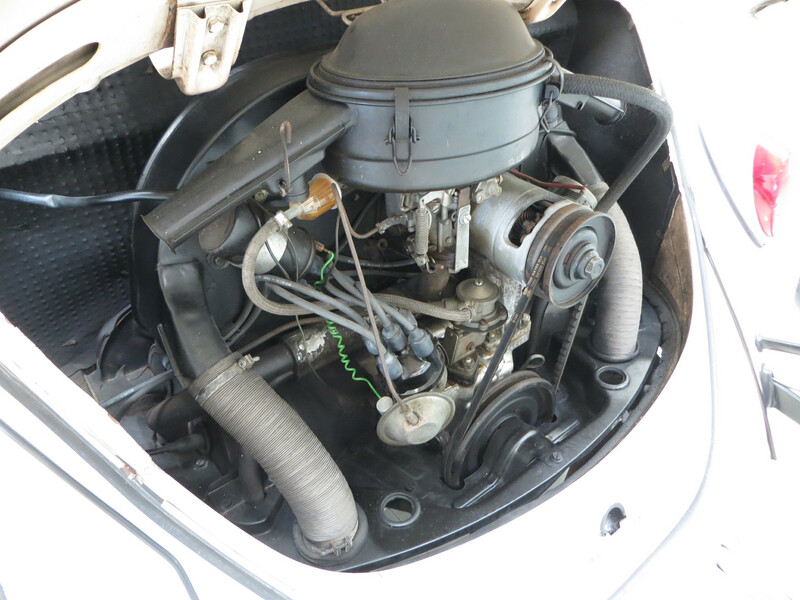 Backup lights are mounted way high and fresh air tubes to the air cleaner are missing in the engine compartment. Pristine and 100% correct are not necessarily the same thing. Just a quick look. Should the under fender detail be black or original colour white? Was the colour combination, fender welt, running board thing just a south of the border item?. I remember these cars new and do not recall matching running board colours at all in Canada. Too young to know for sure, too old to remember! Just a ’67 enthusiast! Looks like the speedometer is in Kilometers only. Don’t think I have ever seen this before. Beautiful.what else can be said? Looks like the fuel filter needs to be taken out of the engine compartment if the car is be driven at all. Drool. 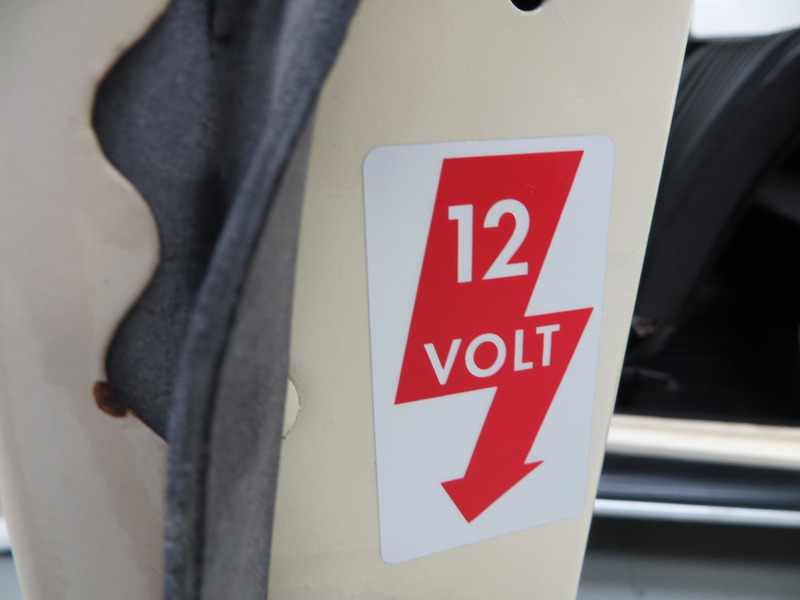 By the way, what does “Sb12” on lights signify? 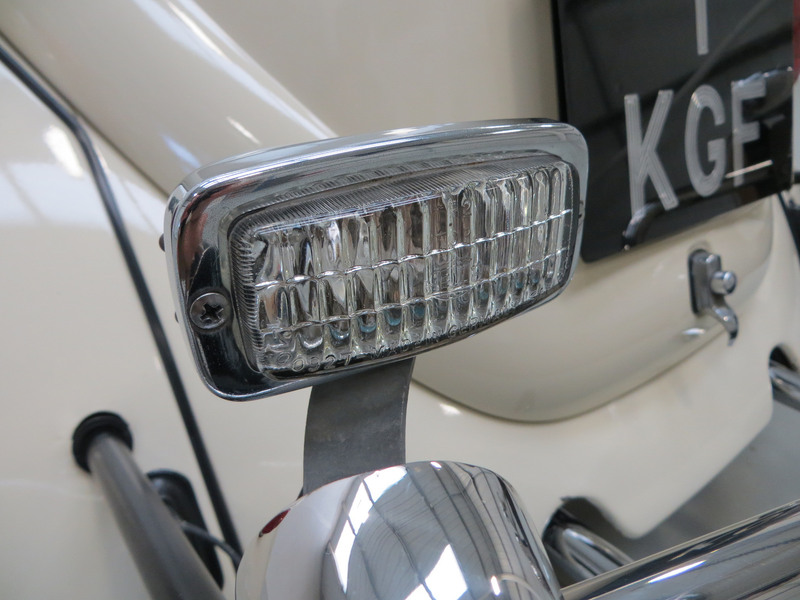 “SB-12” stands for “sealed beam-12 volt” and is stamped into the top outer side of the chrome headlight cover. they were made by Hella.. 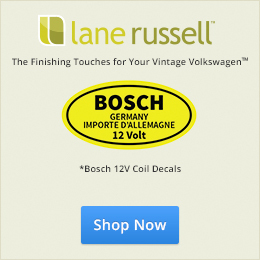 It is not unique to 1967 models, but 67 was the first year of 12 volt models in the USA. Started this list Saturday night, so some information has already been listed by others. 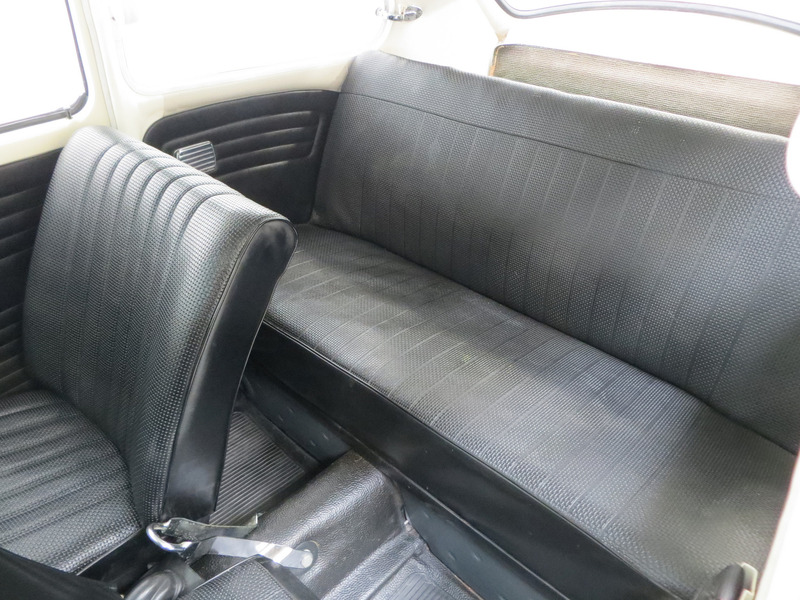 In Equipment section of write up states “padded dash” no padded dash in 1967. States as optional equipment “seat belts” and “vent wings”. 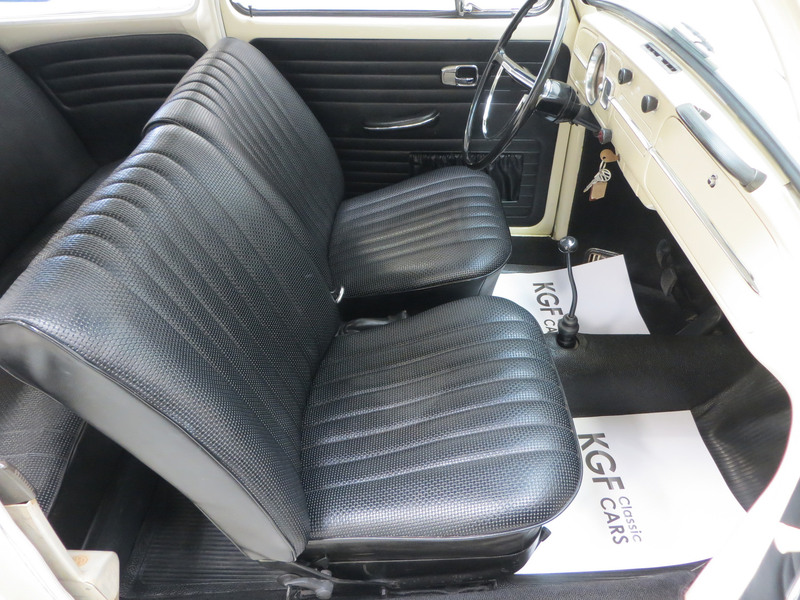 For the US/Canada market, seat belts were factory installed, not an option-under (M 27). Vent wings (door vent glass) was not an option, standard equipment for many years. In Exterior paragraph states “slotted wheels” as “Revised”, the slotted wheels are same as on 1966. States “red turn signal lens” perhaps meaning amber. In same paragraph lists rear window opening as “Revised’, they were available since 1965 and Were a market option (M 93). In same paragraph SD12 should be SB-12. 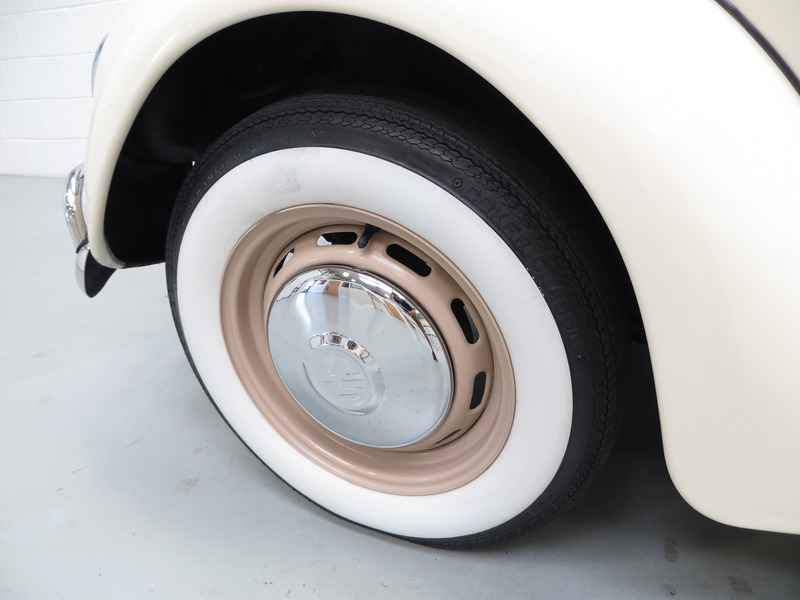 Running board and fender beading should be Savannah Beige (although VW had beading matching vehicle color mostly this one is odd-some references state lotos white as fender beading). 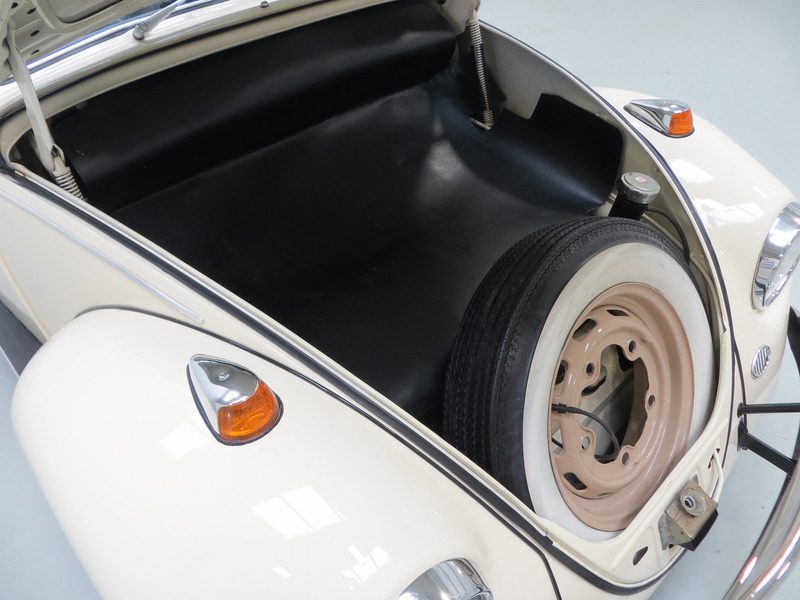 Front and rear bumper bow’s have rubber buffers at mounting points-Original German?? Rear bumper bow’s don’t appear to be lower on inside for hood clearance (early/late production perhaps). Backup lights are mounted incorrectly, should be located further to left and right and peeping between the bumper and bumper bow openings. 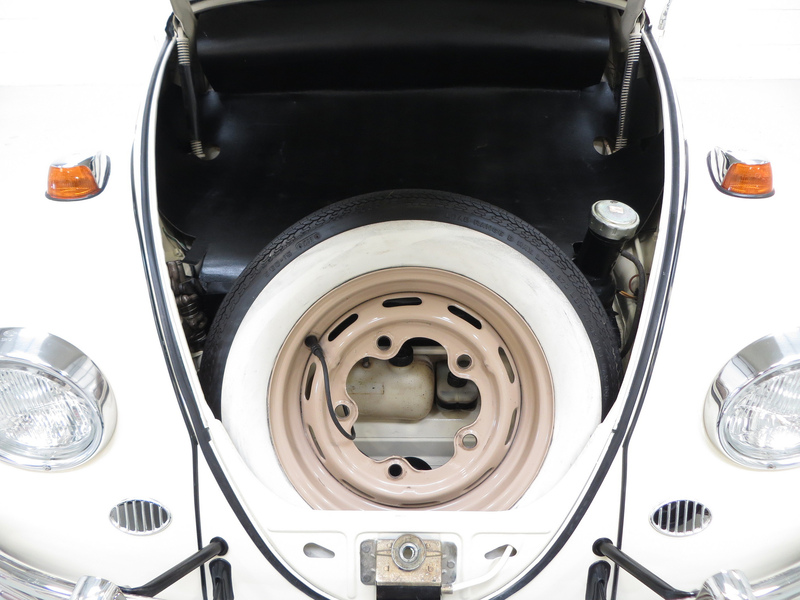 Wheel hub outer should be lotus white (L282) inner gray black (ID43) All for 1966 would be either outer rim pearl white (L87) or blue white (L289) inner hubs would all be black (L41). Bumper brackets and overrider supports silver chrome. 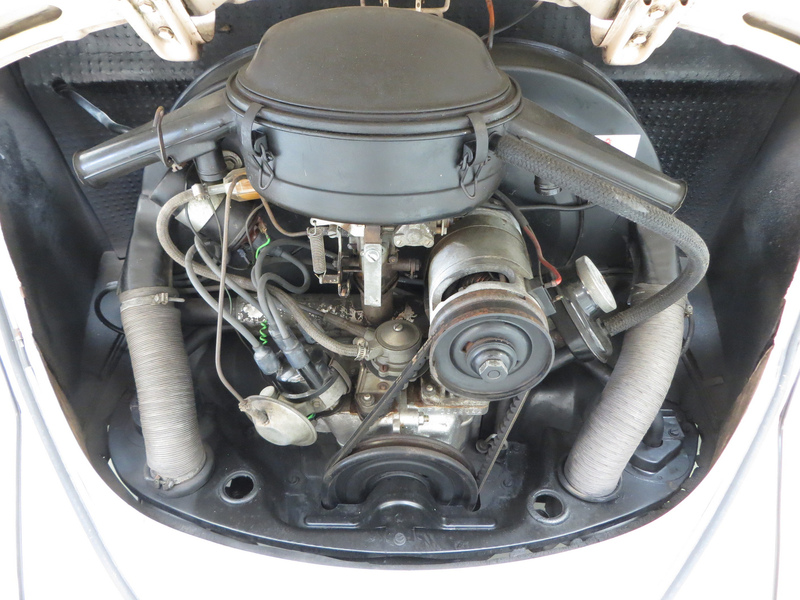 If instrument cover isn’t cardboard would be incorrect, gas tank cap may be later vintage, distributor cap incorrect, fuel pump is suspect as is fuel filter. Preheating hoses missing. 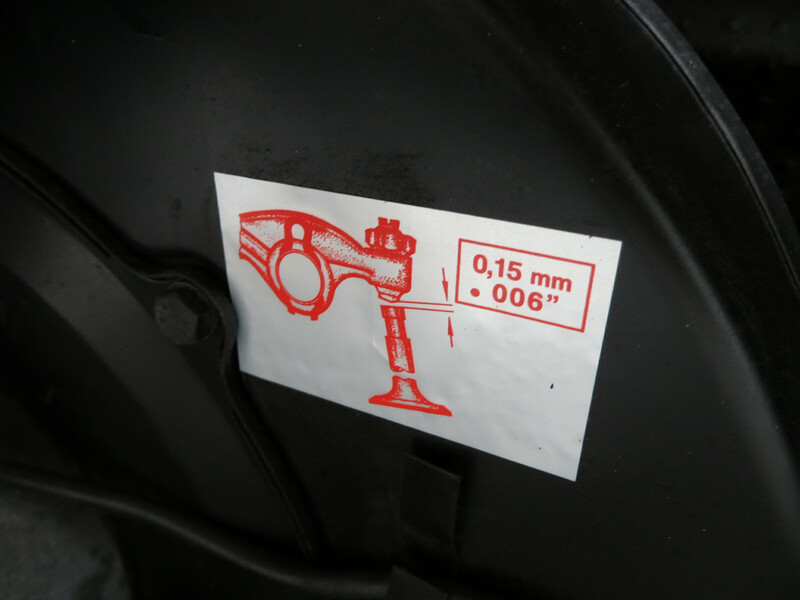 Valve setting decal is either reproduction or nos .006, should be .004 (one cannot change history once it is history-if one rented and mounted up the local time machine and backtracked to late 1966 the valve setting decal would be .004). If interior rear view mirror is black (black is for Standard) it is incorrect. Engine breast plate seal is ratty. 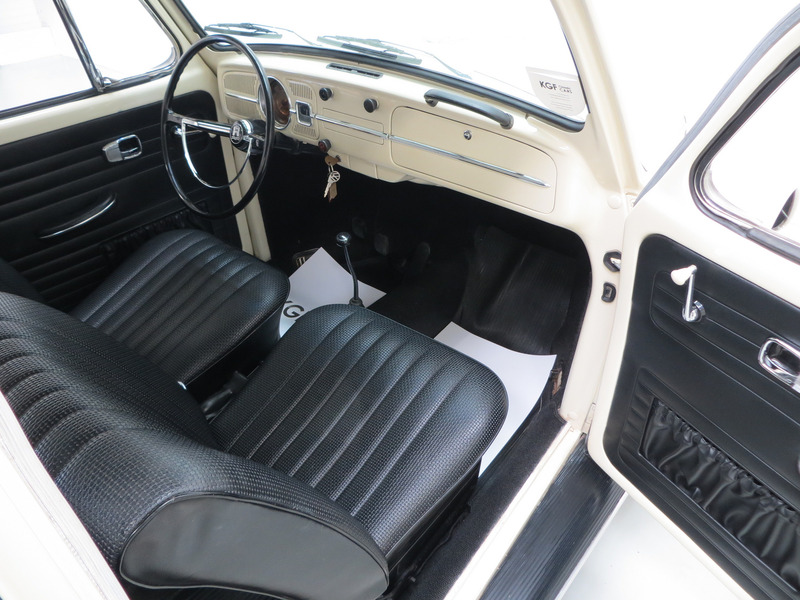 Headliner-cannot see the perforations, should be visible as they are in the seats-1966 would be same (perhaps just not enough focus to bring them in view!) Window winders would/should be black. 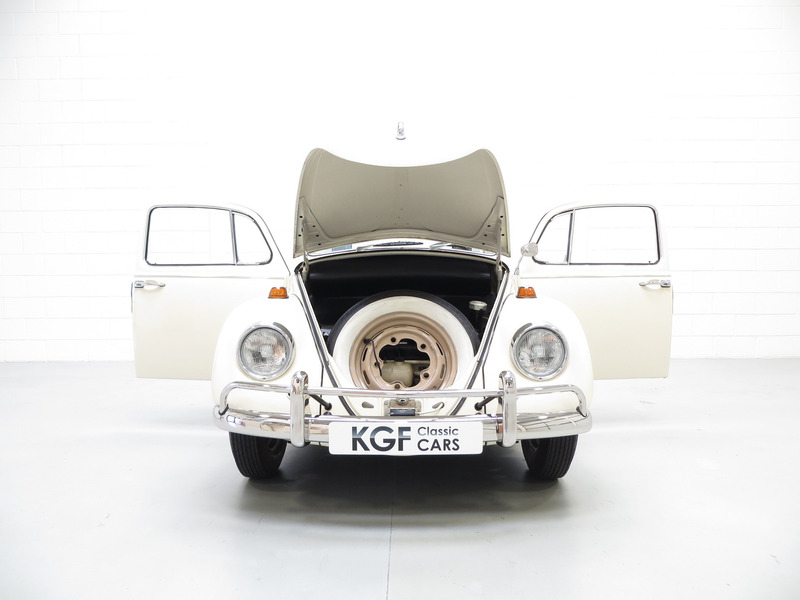 Would be nice to know the Chassis Number-Most 1967 specific parts began with Chassis Number 117 000 001 according to VW. I agree with most of your comments / critiques. This car was very obviously represented as something it is not: a 66-67 years cross-over model containing features from both years. To the best of my knowledge (and a LOT of other folks) there were no such cross-over models sold into the market. 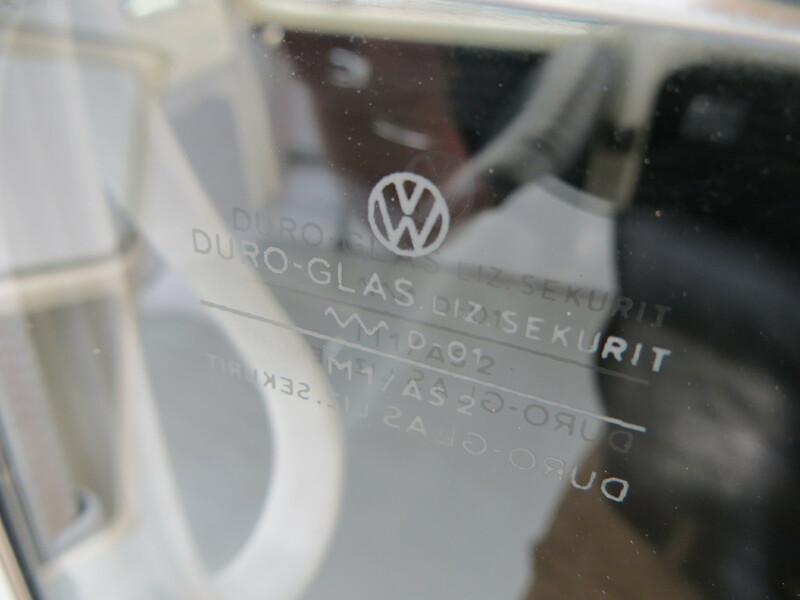 Other obvious non-67 features are the front seat latch releases, the non-67 rear bumper towel bars, etc. This is much more obviously a rebuilt car using a mix of used or NOS parts from 66 and 67 model year Type 1 Beetles. It’s too bad an apparently reputable dealer in classic cars would stoop to this level of deception to market a car, or would so incompetent as to not recognize the vehicle for what it is. 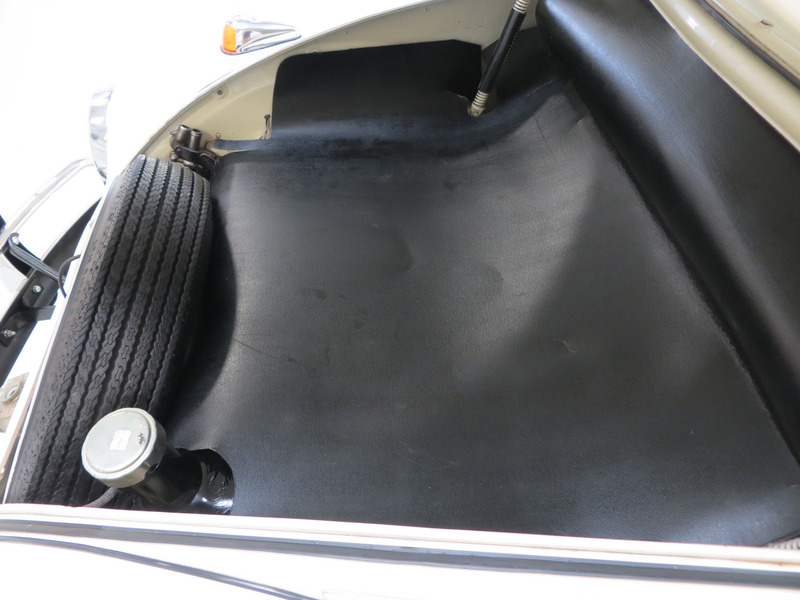 Should install the heat riser tubes to keep the exhaust heat out of the engine compartment. 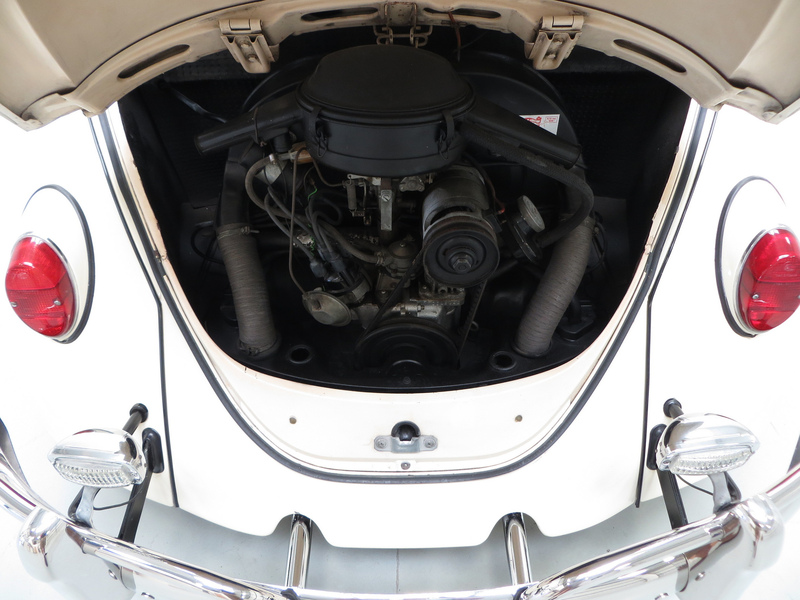 It is advised if you are in a over heated condition to tuck the air flaps on the edge of the stock air cleaner open so to draw in cooler air into the carb. In the summer I disconnect the heat riser tube from the air cleaner. Great looking car but I am not, and never been a fan of the wide white walls. The cars looked best with the Michelin X tires…..my opinion. 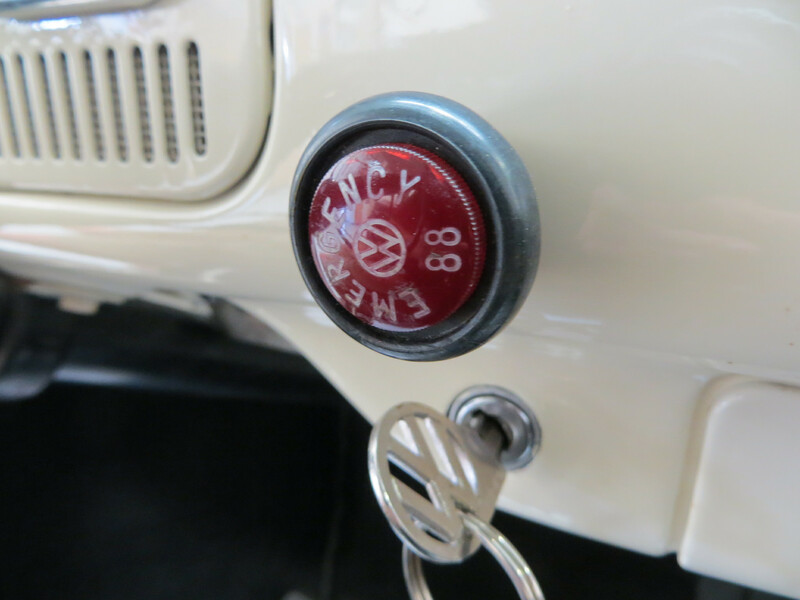 The ’67 came with two style knobs. The fake chrome and the black knobs. They are hard to find. We do have NOS window winders, if you need them. And no, you really can’t fix the fake chrome. They are probably roached.